Just because the holiday season is over does not mean that chocolate is out of the question! I know many of us had our fair share of treats, but who says you can’t have chocolate with your vegetables? 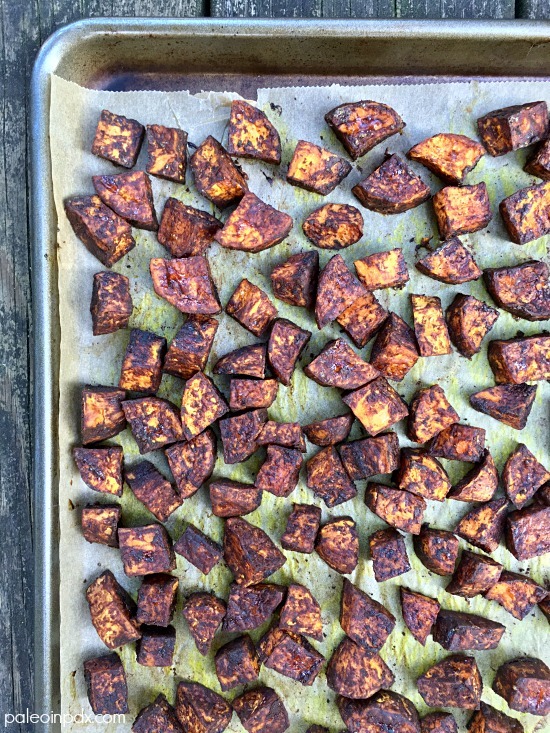 Enter: cocoa roasted sweet potatoes. It might sound wild, but a dusting of unsweetened cocoa or cacao powder on roasted sweet potatoes is divine. It’s a match made in heaven with the natural sweetness and a decadent way to mix things up. For a little spice, I added a dash of turmeric and black pepper too. It’s a magical combo. Also, I know it may appear as if the sweet potatoes are burnt, but I assure you, they’re not. That’s just the covering of cocoa powder. Meanwhile, just add your protein of choice and some greens, and you’ve got an epic meal. My recommendation would be baked chicken breast and sautéed kale. Perfecto! Also, happy New Year too! I hope all of you had great holidays and are enjoying 2018 thus far. I have so much excitement surrounding this year and am feeling giddy, energized, and joyful. There is so much good to come. Preheat oven to 375 degrees F and line baking sheet with parchment paper. Place chopped sweet potatoes in a large bowl. In a small dish, whisk together melted coconut oil, cocoa powder, turmeric, sea salt, and pepper. Pour mixture over sweet potatoes and toss to coat. Place in an even layer on the baking sheet. Bake in preheated oven for 45 minutes, stirring halfway through.